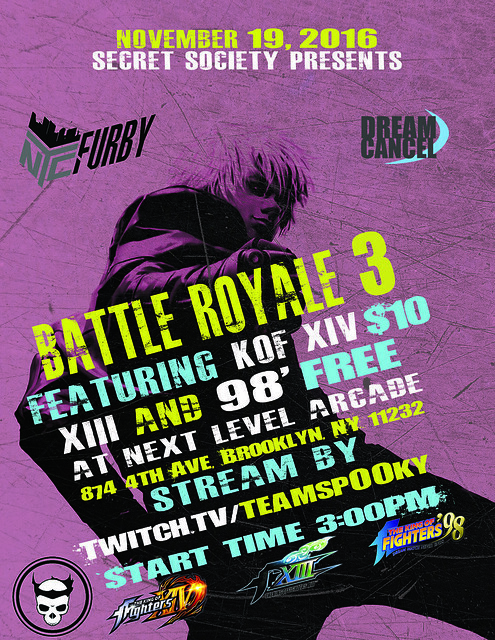 The Secret Society is proud to announce the third installment in our tournament series Battle Royale 3! As always the event will be streamed mixing the old with the new. All those burning to fight come and lay it on the line! Top 3 (if less than 24 entrants) will be a first to 3 set BUT if there are MORE THAN 24 entrants than the entire Top 4 will be a first to 3 set in a Double Elimination Bracket in a first to two series. If under 24 entrants top 3 Pot will be split 60/30/10 BUT if more than 24, top 4 will be split like 50/25/15/10. The Top two placers for the singles event will earn a KOFXIV t-shirt courtesy of SNK PLAYMORE CORP.
3:00-3:30PM signups for KOF98 & KOFXIII will END approximately at 3:30PM. Signups FOR KOFXIV singles will END approximately at 4:30PM so if you aren't going to be there before then have someone call for you to register you in/pay/etc. 4:30PM: The KOFXIV NY Vs. NJ Exhibition starts. Rules of that even will be a single elimination event where each player of the team will play at least once in a first to one format where all players of a team must be defeated. For example, if Team A defeats 3 of Team B's players, Team B will have two remaining members that can possibly still win because they won their matches. Again, this will be a FT1 in all regards so ONCE ALL OF THE PLAYERS are BEATEN, the winning team wins it all. Team New York's Leader has been chosen & will be Ekud Nosdod (whom most know as Hard Bread). Team New Jersey does not have a leader & seems they will not be needing one so the politics will be left up to those players to decide who plays. After the KOFXIV Teams Exhibition, KOF98 Top 4 will be on stream followed by KOFXIII Top 4, then the remainder of KOFXIV singles will be on stream for the rest of the night.